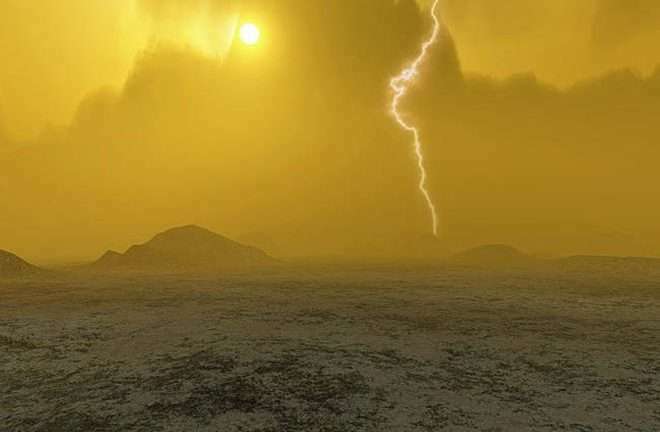 "Venus today has a thick atmosphere that contains very little water, but we think the planet started out with an ocean's worth of water," said John T. Clarke of Boston University, a renowned authority on planetary atmospheres. "Venus is like Earth in so many ways," explained Stephen Hawking. "A sort of kissing cousin. She's almost the same size as Earth, a touch closer to the Sun. And, she has an atmosphere that could crush a submarine." The conditions on Venus today, Hawking says, are almost impossible to comprehend. Planetary scientists say "start by imagining Hell and work up from there." At the surface, Venus roasts at more than 800 degrees Fahrenheit under a suffocating blanket of sulfuric acid clouds and a crushing atmosphere more than 90 times the pressure of Earth's that has flat-out crushed every probe we've sent to it. Using rudimentary computer-generated imagery (CGI), Hawking can be seen traveling in a spaceship to Venus as he passed through clouds of sulfuric acid. However, he finds that the pressure on the planet is roughly 90 times that of the Earth "enough to crush a submarine," while the temperature is around 200 degrees. He explains that the Earth could find itself in a similar situation if greenhouse gases are not controlled. Venus was created at about the same time as Earth, in about the same place, and it's roughly the same size – it would therefore have started with the same materials as us, drawn together from the same region of the planet forming dust left over from the sun. But Venus now has only 0.001% of our water content, and a couple of flybys by the Venus Express may have revealed the reason.